In today’s application economy, interaction between a business and its customers, partners and employees is increasingly through apps. And omni-channel access to these applications—from anywhere at any time—is dependent on APIs. These APIs provide an interface for developers to code against, and must be robust enough to support ever-growing demand. As a result, APIs are perhaps the most critical technology in digital business design today. 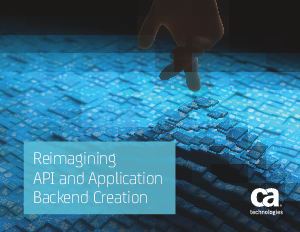 APIs sit between your application clients —apps, websites and devices—and application backends. By leveraging APIs, you can securely stretch the boundaries of your enterprise by tapping into a broad array of digital businesses, digital customers and digital devices. But just as important as the API, is the application backend itself. Behind the API, the data access layer and application logic layer are doing the heavy lifting—implementing business rules, maintaining data consistency and managing interactions with various data sources. These three components—the data access layer, the logic layer and the robust API—are key to the creation of successful apps.